Code analysis is the analysis of source code that is performed without actually executing programs. It involves the detection of vulnerabilities and functional errors in deployed or soon-to-be deployed software. How many times has an application been developed within your organization and then months later been found to be a contributor to a significant IT problem resulting in system downtime, security issues, or compliance failure? If traditional testing methods are the only steps being taken to identify potential risks in a complex infrastructure, additional code analysis will help identify hard-to-find weaknesses and vulnerabilities. Undetected vulnerability in a multi-tiered system can become a big problem rather quickly. It takes more time and money to repair these issues than any other type of source code problem. An efficient, automated code analysis solution is capable of taking this process a step further toward peace of mind during the deployment process. Why Use Code Analysis with Traditional Testing Methods? Every missed vulnerability increases the risk of large system-wide failures, decreases security, and takes away from an IT budget. Code analysis software designed to evaluate size, complexity, and risk of existing source code can provide insight on potential undetected vulnerabilities. Automated code analysis solutions deliver pertinent information about the current state of each application deployed within an enterprise-driven, multi-tiered environment. CAST provides solutions for detecting the unknown in order to increase the dependability of your entire infrastructure. Architecturally complex violations and defects residing in different application layers constitute approximately 8% of software vulnerabilities, but average 52% of the time and money organizations spend on maintenance efforts. If your organization is currently unable to identify structural vulnerabilities before system testing when they start to cause IT costs to skyrocket, enterprise-grade code analysis may be a useful addition to your process. If business disruptions, unknown productivity levels, or uncontrollable IT expenses are bringing your organization down, code analysis software is an option for decreasing IT expenses and accomplishing early problem identification. 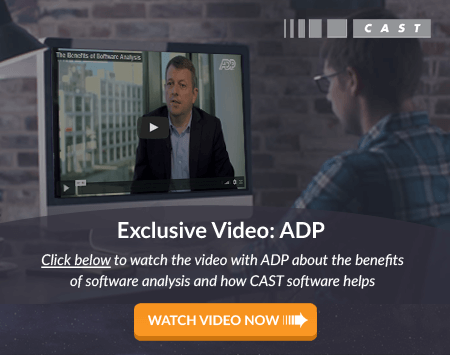 See what you've (and your testers) been missing - take a tour of the CAST Application Analytics Dashboard today.